In 2005, after a long period of planning, construction of the Mesa Del Sol community in Albuquerque, NM began. The city desired an environmentally friendly and well-designed area with an easy feel and look that blended with the surrounding scenery. 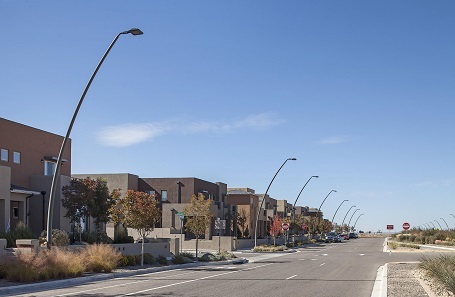 Utilizing Valmont custom engineering capabilities, the city partnered with Valmont to create a unique curved street lighting design that met all of its specific requirements. Despite interest in the project from competing pole manufacturers, only Valmont had the tools and expertise to deliver the product that the client needed. In order to cast enough light on both sides of the wide streets. The custom poles enhance the city’s look and feel, but do not attract unwanted attention – a balance that is essential to Mesa Del Sol. Currently, 56 poles are installed and there are more to come as the partnership between the city and Valmont continues.